Arms. Argent, semee of cross crosslets, a lion rampant, sable. Crest. 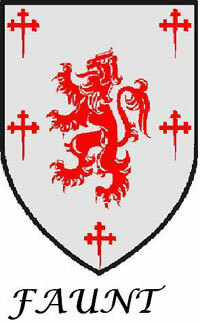 A demi lion rampant. The Ffont family settled in Galway in the beginning of the fifteenth century. They sprung from an ancient English family of Leicestershire, and, are said, to have been established in Athenry, as early as the reign of King John. The name is now nearly extinct. Geoffry Ffont, who died near Galway, in 1814, aged 105 years, is supposed to have been the last survivor of the Galway branch of this family. Not a great deal is known about the Ffont family, but they were well connected with the other tribes of Galway. Francis Athy, known to many of us as the father of "Captain" George Athy, was born in Galway abt.1612/15, to Walter Athy of Galway and an unknown Martyn. From the naming pattern used by the family, his mother may have been a daughter of Francis Martyn FitzThomas. Francis was listed as Sheriff of Galway in 1639/40, his wife also appears to also have been a Martyn. Again following the naming pattern we can establish this may have been the daughter of George Martyn FitzWalter, a third cousin to his mother. Their children were Walter Athy b.1640, George Athy b.1642, John Athy b.1644. From the Bodkin genealogies we also find a daughter Susannah Athy, married to Patrick Bodkin. Their son Thomas Bodkin was married to Julian Browne who was listed among the traitors within the walls during the siege of Galway. Francis did not live in Athy's Castle, but had a house on St. Augustine St. in Galway, this along with the naming pattern would support that he was the second son of Walter. As late as 1641 Francis Athy is shown also owning property in Athenry. He would have had an elder brother named John, who would have been the family heir. This John is mentioned as the father of Maria Athy of Galway, married to Francis Ffont, who died 1670, son of Stephen Ffont and Juliana Kirwan. Their son was Dominick Ffont who died in 1693.